I think they came out quite well. I didn't have much choice as to what colour to use for the surround, as they only use three (red, yellow, blue) or five if you include black and was-once-white. Black and red were out at they would have favoured one suit over the other. It's not a good yellow (I picked that out in the frame instead). I didn't want to draw attention to the fact they had two centuries of grubbiness on them by using white. That left blue or some non-present colour such as green. 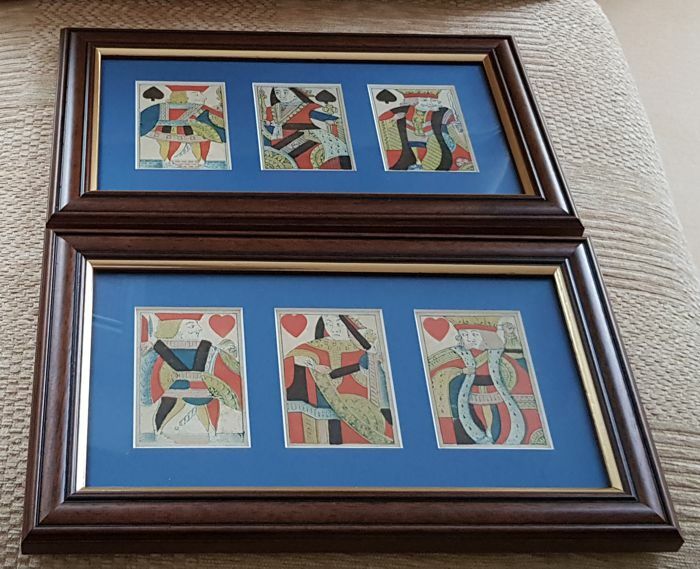 I looked at some of the latter in the shop and nearly went with a green as it sort of looked as if they were lying on baize, but I decided on the blue instead as it connected the two framings better. Needless to say, my wife doesn't see the point of them and doesn't want them on any wall she can see, so I'll have hang them to my office at work. I'm sure there are some hooks there that have been left by previous occupants of my office, from back in the day when there wasn't an order not to make holes in office walls. I just have to decide where those previously-made hooks will be.